The Center for Great Plains Studies is pleased to announce a lecture by the 4th Annual Great Plains Distinguished Book Prize winner. The Great Plains Distinguished Book Prize was created to emphasize the interdisciplinary importance of the Great Plains in today's publishing and educational market. Only first edition, full-length, nonfiction books published in 2008 were evaluated for the award. September 8 • 3:30 p.m. Reception begins at 3:00 p.m. 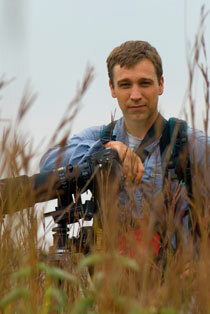 Photographer Michael Forsberg's newest book: Great Plains - America's Lingering Wild is an extension of several years of dedicated work trying to put a face to the native wildife, landscapes and conservation challenges in the heart of the North American continent. In this photo driven presentation, Mike will offer a look into what it took to pull the book together, share some stories from the field, and what he learned along the way. Ends with a multi-media piece taking the audience on a journey through the lingering wild of the Great Plains. This lecture is part of the Paul A. Olson Seminars in Great Plains Studies series.